Shown above are a pair of old QSL cards for York, Pennsylvania, ham-radio operator Barry Leffler. 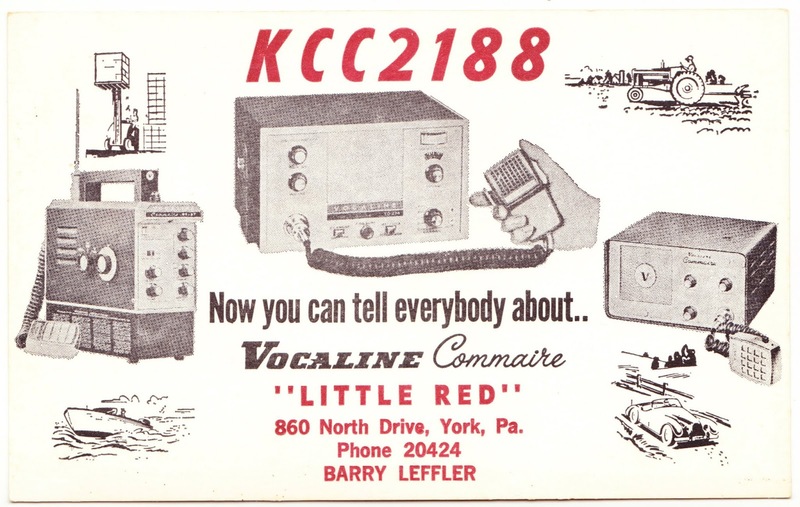 They show the evolution of Leffler's response cards for his communications under call sign KCC2188. 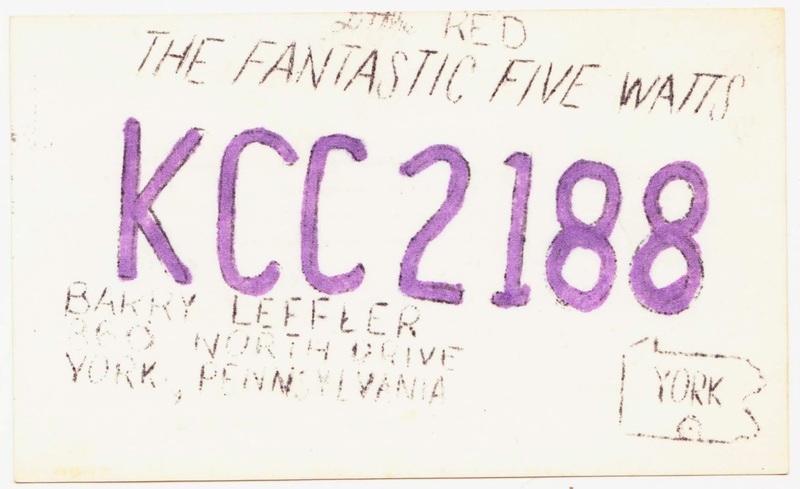 The first card, undated and never used, is a badly mimeographed, five-inch-wide card for "The Fantastic Five Watts" of "Little Red." There's a little map indicating the rough location of York County and York City in southcentral Pennsylvania. The second card was never used, either. It includes the standard lines on the back to fill in date, channel, signal strength, etc. Also, oddly, there's a pre-printed reference to KCC 3373 — a different call sign — on the back of the card. That's Ronald E. (Joe) Sellers, who I wrote about in January. I wonder if Sellers did some side work helping fellow ham-radio enthusiasts with the design and/or printing of their QSL cards. Click on the QSL cards label below to see 30 other Papergreat posts related to QSLs and ham radio. Finally, a reference on Papergreat to a living person! Yes, I did see that. We'll see what happens. He hasn't actually posted on Facebook in 6.5 years, and it can be difficult to contact/message someone that you're not Facebook Friends with. But we shall see.